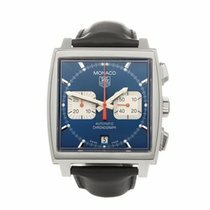 This is a pre-owned Tag Heuer Monaco gents CW2111-0 watch. 38mm by 46mm case size in stainless steel, black baton dial on a black leather bracelet, powered by an automatic movement. 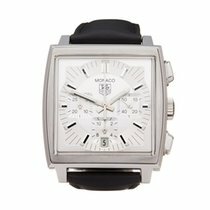 This Tag Heuer is in excellent condition complete with xupes presentation pouch. Circa 2000's. Our Xupes reference is W4805 should you need to quote this.